The California Geographic Alliance is pleased to announce the 3rd annual “My California GIS Mapping Showcase and Competition”. This exciting statewide opportunity encourages middle (4th-8th grade) and high school (9th-12th grade) students to harness the power of Geographic Information Systems and get connected with their state by producing an online map that focuses on stories, issues, or ideas that are important to them. 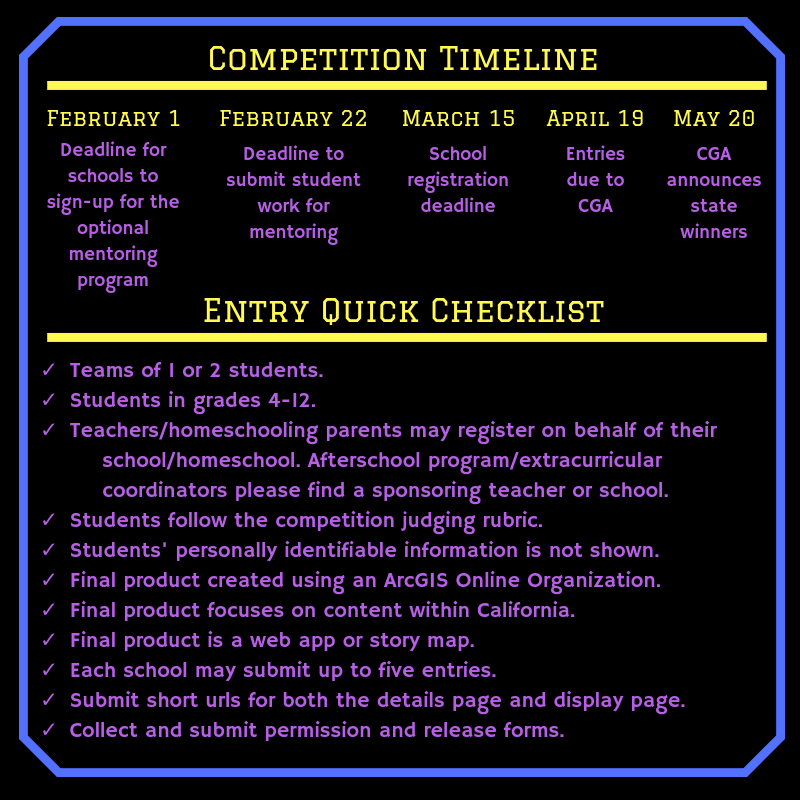 Schools may register for the competition at: https://arcg.is/TXzHap. For schools who would like to participate in the mentoring program, registrations are due before midnight on Friday, February 1, 2019. If available, GIS professionals will provide feedback on students’ projects. The regular registration deadline is midnight on Friday, March 15, 2019. For the detailed contest rules and judging criteria, go here. GIS Professionals and Professors, sign up to become a mentor and/or judge at https://arcg.is/04z5m. Mentoring will occur March 1-March 22 and judging will occur April 19-May 3. Contact Dr. Waverly Ray at CAmapcomp@gmail.com with questions about the contest. See last year’s winners and honorable mentions here.